What is the value of a college degree? The four-year college experience is as American as apple pie. So is the belief that higher education offers a ticket to a better life. But with student-loan debt surpassing the $1 trillion mark and unemployment of college graduates at historic highs, people are beginning to question that value. In College (Un)bound, Jeffrey J. Selingo argues that America’s higher education system is broken. The great credential race has turned universities into big business and fostered an environment where middle-tier colleges can command elite university-level tuition while concealing staggeringly low graduation rates, churning out graduates with few of the skills needed for a rapidly evolving job market. Selingo not only turns a critical eye on the current state of higher education but also predicts how technology will transform it for the better. Free massive online open courses (MOOCs) and hybrid classes, adaptive learning software, and the unbundling of traditional degree credits will increase access to high-quality education regardless of budget or location and tailor lesson plans to individual needs. 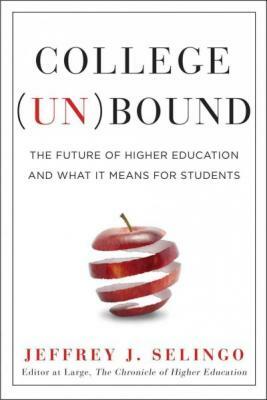 Incisive, urgent, and controversial, College (Un)bound is a must-read for prospective students, parents, and anyone concerned with the future of American higher education. Jeffrey J. Selingo is editor at large for the Chronicle of Higher Education, where he has worked in a variety of roles for more than fifteen years, including four years as the top editor. He frequently speaks before national higher-education groups and appears regularly on regional and national radio and television programs, including NPR, PBS, ABC, MSNBC, and CBS. His writing on higher education and technology has appeared in the New York Times, the Washington Post, and the Huffington Post. The National Magazine Awards, Education Writers Association, Society of Professional Journalists, and the Associated Press have recognized him for his work. He is also a senior fellow at Education Sector, an independent education policy think tank. He previously worked for the Wilmington Star News in North Carolina, The Arizona Republic, the Ithaca Journal, and as an intern, for U.S. News & World Report, where he contributed to the magazine’s Best Colleges guide. He received his bachelor’s degree in journalism from Ithaca College and his master’s degree in government from Johns Hopkins University. He lives with his wife, Heather Salko, and two daughters, Hadley and Rory, in Washington, D.C.